I am a big fan of A Tribe Called Quest and recently saw the documentary “Beats Rhymes & Life: The Travels of A Tribe Called Quest”. One of the most iconic groups of the nineties, A Tribe Called Quest and took Hip Hop to a new level. A Tribe Called Quest split up in 1998, but due to Phife Dawg’s battle with a very serious case of Diabetes and challenges with paying his rising medical bills, the group reformed for a tour in 2008. You may wonder why I am talking about this? Well, shortly after seeing “Beats Rhymes & Life” I watched another documentary, “Simply Raw – Reversing Diabetes in 30 Days”. It’s clear that we are in the western world are in the midst of a diabetes epidemic. Nearly 3 million people in the UK have been diagnosed with diabetes (approx 4.45 per cent of the population) and this number is increasing by over 100,000 people per year. This excludes people yet to be diagnosed. So is there a way to stop this epidemic and reverse diabetes? Simply Raw: Reversing Diabetes in 30 Days is an independent documentary film that chronicles six Americans with diabetes (one with Type 1) who switch to a diet consisting entirely of raw, organic, plant based food in order to reverse disease without pharmaceutical medication. 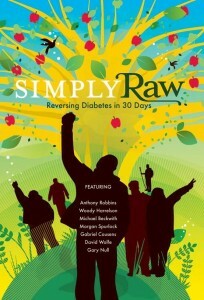 Simply Raw reveals, with startling clarity, that diet can reverse diabetes and change the quality of people’s lives. The film captures the human drama and struggle of these courageous individuals making a quantum leap of faith from a traditional junk food diet to a raw plant based diet and it shows revealing moments of nurturing, compassion, and human spirit. If you are interested in the impact your food choices can have on your health, then I highly recommend watching it.